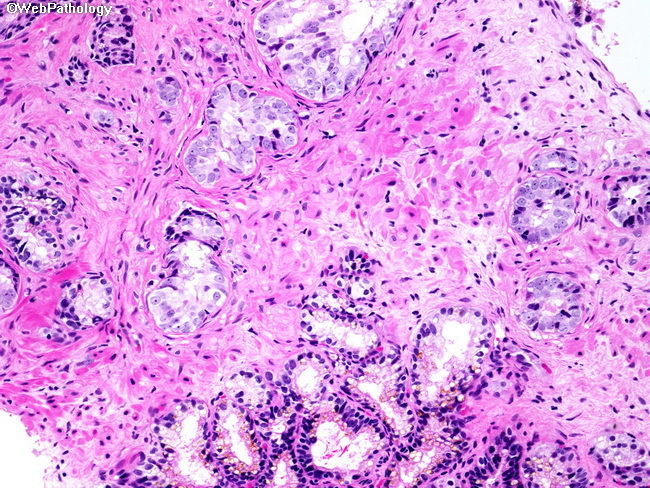 The image is from a directed biopsy showing seminal vesicle involvement by prostate cancer (pathologic stage T3b, TNM classification). The patient usually has high-grade, high-volume disease and such cases are being seen less frequently in this era of PSA-screening. By definition, seminal vesicle invasion is extra-prostatic extension of the tumor. The tumor has to be present within the smooth muscle of the seminal vesicle. Involvement of just soft tissue around the seminal vesicle is not sufficient to make that call.